In support of books as holiday gifts, I’m hosting Blogger Book Boost. Instructions are at the bottom if you want to participate. Please do! My aim is to gather lots of good book recommendations for holiday reading and presents. I have a tradition with one set of relatives of exchanging books every Christmas. Books get away from the materialism of the holidays and get back to sharing something special. Plus they are affordable. My family celebrates Hanukkah and Christmas, and both are three weeks away. Book sales are way down since the economic crash. If we still want to see anything but "gift" and celebrity books published, we need to put our money where our reading eyes are. Independent bookstores are suffering, and even Borders is at risk of folding. I love blogs, but they don’t replace books that you can take anywhere and give as a presents. Here is my list of new release books (last 6 months) that would make great gifts. I’ve linked to my blog reviews from the titles. A girl with an autistic brother learns about love and patience with a sense of humor. Last year’s Newbury Honor book has now been released in paperback. 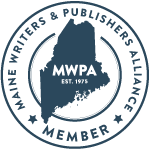 Maine author. A teenaged boy in a not so futuristic world tries to prevent global disaster. Add romance, a penguin and a psychic younger sister, and it’s a fun ride. Maine author. A lovely old house on Nantucket Island brings together an odd assortment of characters. A sunny story of love and fulfillment that will chase away winter blues. A personal story of Sephardic Jews in Egypt during the 1950's. A look back into a happy family history and a lost elegant lifestyle. An all American story from the midwest. A former librarian with a big heart is married to an unpopular Republican President. Sounds like Laura Bush? Beautifully written tales about the ethnic American experience and modern relationships. The stories are bittersweet without a word out of place. To Siberia is set in Denmark in the time around the Nazi occupation. The protagonist is a girl who dreams of leaving her small village to venture further north to Siberia. Her rakish brother dreams of Morocco and bootlegging. The two form a close bond over books and adventures. Per Petterson is a master of writing simple prose that reflects the icy beauty of the northern landscape. The home feels as cold inside. A childhood devoid of love, except between siblings, is all the more barren due to what is missing. Poverty is both the lack of material and emotional comfort. The story is bleak, but the heroine is strong and uncomplaining. She is a vital force, rescuing both loved ones and the enemy. There is pleasure to be found in living, no matter how hard the circumstances. It’s an uplifting tale for these difficult times: it could be much worse! 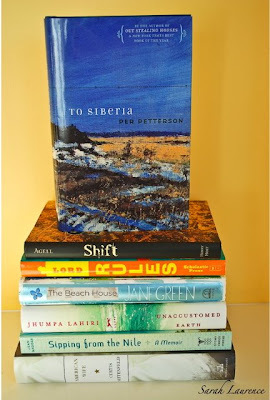 To Siberia is the second novel of Petterson’s to be published in the USA although it was published first in his country, Norway. After Out Stealing Horses won an international award, the American publishing industry took notice of this talented foreign writer. It wouldn’t be the first time that an author’s books were published out of order. 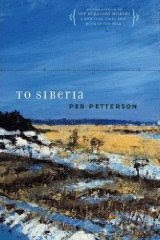 Hopefully we shall see more of Petterson’s work in translation. I loved Out Stealing Horses more of the two, but both are well worth reading. 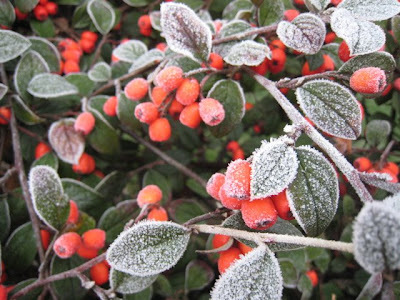 To Siberia makes a beautiful gift both inside and out. I know you shouldn’t judge a book by its cover, but Steen L. Petterson’s painting is stunning. Is the artist the author’s brother? If so, then this tribute to a brother’s love is all the more personal. There are many other books that I’ve reviewed in my sidebar. I only blog about books that I like. Many of you have asked about my novels. Nothing is published yet, but my agent is working on it. Maybe another year’s holiday…. Instructions on how to hyperlink in the comments and in your blog. Or just post a comment if this is too tricky. 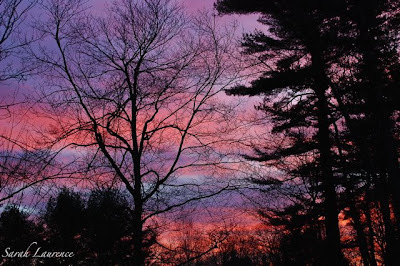 Sunrise out my window in Maine. Today I’m traveling back to Maine to rejoin my family so I’ll be off line most of the day. Next week I’ll blog about my fun time in NYC, including meeting two bloggers that you'll recognize from my sidebar. If you want to join, add a comment, and I’ll update these links. Oh, that beautiful sunrise. Hallelujah, and you are preaching to the choir, sister. It's funny; I just wrote a blog about not having enough time, but I always make time for reading. I've been offline a lot lately, partly because I've been on a reading jag. How could Border's be in trouble? (I know I've done my part to keep it in business . . . also Amazon, Waterstone's, Barnes & Noble, WH Smith's, and numerous independents.) I've actually had to stay at home today, because I'm expecting so many Amazon packages! Thanks for the great reviews . . . I will join your "boost" this week. Also, "safe journey" back to Maine. I look forward to hearing about your NYC adventures. This is a wonderful "boost". I always give books for Christmas and have bought several for gifts already. I'll try to participate in within the time slot. I just ordered a huge box of books for my husband and me (well it's hard to shop for books and not pick up a few for myself!). Roxi is compiling her wish list. How do you keep track of who has what? When I want to give books to people outside of my immediate family, I usually give gift cards. And I, too, am shocked about Borders! How can this be?! I will try to do a book boost this week as well. How exciting to meet two more bloggers! Can't wait to hear about it next week. Lovely idea and one that prompts me to ask you if I can find Shift on amazon.co.uk. or any other trustworhty (I hope you understand) website. Thanks for your recommendations. I think Shift would be suitable for my almost eleven-year-old son. That sunrise is stunning, breathtaking, and everything else wonderful. You managed to capture it perfectly! Thank you, thank you, thank you for posting your book recommendations. My extended family has decided to make this Christmas much more economical and personal and, you're right, giving gifts is a much more personal, less materialistic gift. Weirdest thing happened. I finally looked at my reader, which I hardly ever do, and saw that you had just posted. I started to wonder how I didn't know it already and I didn't even know about your post last week. I looked at my blog and it turns out you had been erased from my sidebar!! I don't even know how that happened. So bizarre. All, I’m back home although will be off line tonight after 5:00. I should clarify Blogger Book Boost (BBB): recommend books that make good gifts that are currently in print. They do not need to be new releases. You can learn more about the troubles in publishing on Galley Cat, the publishing industry blog. It’s under “book blogs” in my sidebar. It may take me a few days to catch up on your blogs as I’ve been away more than a week. Bee, good to hear that you’re back on line and reading. I always enjoy your thoughts on books and look forward to your post. If more people were like you, Borders etc. would be fine. Sadly, book sales have been in a slump. Willow, I guessed you’d be a book giver. I’m looking forward to your recommendations. Do come back and post a comment with a link when your BBB post is up so readers will find it. JAPRA, the best way to avoid giving the same book twice is to give new release books. People are less likely to have read them and hardcover editions make nice gifts. I’ve also done the book gift certificate. Thanks for bringing that up. I was surprised to hear about Borders problems too. Thanks for joining us for BBB. Tina, how about your favorite gardening book? I’m always glad to hear people are reading Maine authors like Stephen King. ACIL, I remember how rare sunrises were in England, but those pink misty mornings were lovely too. You can get Charlotte Agell’s Shift from amazon.co.uk and amazon.com. It’s also in bookstores in the USA. I’m curious to hear what your son thinks of it. My kids loved it. Alyson, welcome back! I’ve accidentally lost blogs from my sidebar when reorganizing or dropped ones that weren't being updated. I’m glad to hear I’m back in your blogging family and that you are going with some book gifts too. Sarah, I will think of a good garden book to read. I have tons so give me some time. I am so behind on reading all the blogs I usually read. I have just spent, oh I don't know, but probably 4 or 5 hours getting caught up on all of yours as it has been 2 months. I have just got to get back in a good routine of reading the blogs that I like. Me bad!! Anyway I enjoyed them all and just loved the picture at the quarry and am glad you are not up there now as there is a bad fire. Roads closed all over the place. I have a daughter that lives up there with a son that goes to the high school where the raod is closed but they must have let the buses take the kids home. I will have to go to her blog next and find out what the scoop is. All the fall color and sky ones are stunning, also enjoyed seeing Stella. Enjoyed the cyberspace trip to NYC and am glad you got to go to your brother's big 40 party. Loved the one on Main Street. I started reading your blog when you were in England, as you know but now it is really neat to see all the things in Brunswick and esp the pic of you and my daughter. We all really enjoyed meeting you. BTW, I have heard that Frosty's has been up for sale for some time now but they are having a hard time selling due to the conditions put on the sale. Not sure if that is truth or just people changing and or adding to a rumor. Borders is in trouble? Really? I was just there shopping this evening. This is a good idea you have about the books. I will have to look into it. There is nothing like unwrapping a gift and finding a brand new hardcover book inside. Delightful! The book boost is a great idea. I think I lack the confidence to send a recommendation here but might consider putting a few in my "nature blog." "Branch out," methinks. I am big these days on biography and historical fiction. I am a book giver, also! My god-daughters have received books from me every Christmas. They now have quite the library built up. I'll definitely take part! I'll get my list together and send it soon! This is a wonderful idea, Thanks! Welcome back, Jean! I’m so sorry to hear about the fire in South Paris. I very much enjoyed meeting you with Tina at Frosty’s. I do hope it keeps going. Maine Street wouldn’t be the same without it. Thanks for your nice comments. Merelyme, this blog community is full of readers, but sadly we don’t reflect the rest of the country. I’d love to hear your recommendations. Mary Ellen, welcome to my blog! You’ll find many other book lovers and some other Mainers here. Troutbirder, do share. My parents are fans of biography and historical fiction too. Pamela, I knew you’d be a book giver. Thanks for joining us! Edi, welcome to my blog and the Book Boost! Charlotte, I knew you’d have some good young adult novels on your list. My son loved The Book Thief. I’ll have to check out Wild Girls; I’m continually impressed by how many good books Jean Naggar has agented. Good to have another Maine author recommendation. Okay, I found two garden book (by the same author). I will be posting it next week so I'll come back with the link once I do. This is a great idea. It's true that books, especially good-quality ones, are among the best gifts that can be given or received. I like your recommendations. I will try to post some of my own by the 9th. I read an article about Border's today. I think it's going to go under, but I hope it doesn't (even though I don't shop there since I have a membership at Barnes & Noble. There are no small independent bookshops around here that I know of, which is sad). Sarah, thanks for stopping by my blog. I'm thrilled to find out about you, and can't wait to read your new book. I love to read, and it sounds like your subject matter is near and dear to my heart. I think I read in one of your comments that you are in the Brunswick area - I worked at the newspaper (the Times Record) there for 12 years right after college and loved it! Not sure I had the technological finesse to follow the post instructions but I did put a book review on my blog. The subject is Devil's Brood by Sharon Kay Penman. It's a great book! I will do my best to come up with a short list of super books for the holidays. Yes, books make splendid presents - we try to give everyone at least one - light or serious depending. Great idea. My blog has a number of book suggestions and more coming, probably Monday. In the meantime, I also just did a newspaper column on my choices. Thanks, Tina, I’m looking forward to it. Donna, that’s great that you’re joining the Blogger Book Boost too. I’ve always loved independent bookstores the best, but the big chains do help keep publishing afloat. It’s not only Borders that is suffering. Houghton-Mifflin-Harcourt has an acquisition freeze and has fired close to 200 of their employees including senior editors since their merger. Random House has totally restructured after Doubleday fired 10% of their employees. Welcome, TSC, and thank you! I love your handle. Mary Ellen, thanks for the encouragement. I wrote another chapter today. I know the Times Record well; I occasionally pen a political Op. Ed for them. I love that our region has a daily newspaper. Thanks for sharing Andrew’s novel. He’s a follower of this blog too. Troutbirder, people can click on your name to find your blog and review. I enjoyed it. Elizabeth, it was such fun meeting you in person! I’ll be blogging about that next week. I’m looking forward to your book suggestions. Well done, Ms. Wis! Our first hyper link. Gardening books make for great gifts. How exciting! Can't WAIT to see all the Blogger Book Boost lists. Thank you so much, Sarah, for initiating this - an absolutely wonderful idea. Especially now that the holiday season is fast approaching. Books play a huge part in the lives of all my family...and many of my friends...so I'll be perusing the lists avidly for ideas. I'll also come back here with a link to my recommendations a bit later. I, too, love the independents. My favourite book store of all time was on St. Thomas in the US Virgin Islands. We lived there for several years and I spent many absorbing and happy hours in that tiny little shop filled with literary treasures! I do hope they are still going. Books have always been my favorite gift. Before we left Illinois last weekend, our new neighbor ran over and handed me one. What a delightful surprise. She said she thought it might come in handy, and boy was she ever right. I will try to get another post in sometime this week and talk a little about it. This boost is just what we all need right now--no calories yet mind-expanding. Thanks, Sarah! Probably my favourite Christmas present is the book token. Alas, no one likes giving them - including me! Tessa, how nice to reconnect! There are few things better than a favorite bookstore, but perhaps we can recreate that browsing spirit here. It’s all about sharing books so thank you! W2W, it sounds like you’ve moved into just the right neighborhood. Books over sweets will be my motto. It is so tempting…. Dave, isn’t that the truth about book tokens? How funny! Have a great trip! Loved the book post! Sarah, JAPRA and I have both posted our Book Boosts! Hi Sarah - I enjoyed reading your recommendations and will be checking out the other posts. I broke out of my blogging slump in order to post on time :) Here is my post with a variety of selections. Bee, JAPRA, Tina and Cindy thank for your Blogger Book Boost posts today. Very interesting and original suggestions. The Book Boosts have been fantastic - my Amazon bill is going to go soaring into the sratosphere! I've finally managed to finish mine - it was all the linking that flummoxed me at first. Now, however, I'm a fundi! Thanks so much for hosting this, Sarah, it's just wonderful. Oh goodness, I've just realised that I've duplicated a book on your list, Sarah. (Unaccustomed Earth.) Yikes - sorry! Tessa, thanks! Unaccustomed Earth was so good it deserves duplication. Bee said she wanted it for X-mas too. This has been so much fun, pooling great books from imaginative readers.